Peony bushes chould be mulched and seedpods removed. Cut old canes of climbing roses so new shoots can grow. Control rust on hollyhock by removing infected leaves. Divide iris and day lily when done blooming. Cut leaves back to about 8″. Thin and transplant perennials sown in June. Complete outdoor sowing of perennial seed. Inspect vegetables and herbs for pests daily and treat. Harvest onions and early potatoes when tops begin to shrivel. In early July, plant lettuce and spinach for fall crop. Pre-germinate on moist towel or plant deeper than in spring. Plant kale, bunching onions, cucumbers, beets, rutabagas, and turnips, cabbage family seedlings and peas for fall harvest. Keep ripe vegetables picked to maintain productivity. 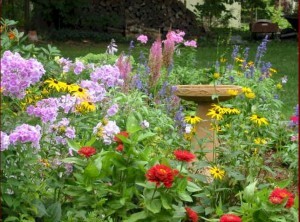 Control garden weeds to prevent them from going to seed. Water plants well for maximum growth. 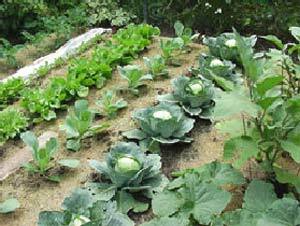 Clear garden beds immediately after harvest. Destroy any diseased plants by burning, composting in a hot pile, or sealing in container for disposal. Watch for spider mites during hot, dry weather. Juniper and spruce needles turn rusty colored if infested. Water newly planted trees weekly if needed throughout the summer and apply a mulch (3″ or less) to maintain even soil moisture. During dry spells, water all trees deeply every 2-3 weeks. 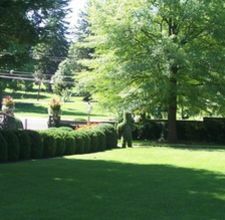 Prune yews, junipers, and arborvitae by mid-july. Remove suckers from grafted plants. Water fruit trees during dry spells or they may abort fruit. Trees need 1″ of water weekly during fruit growth. Remove old canes of summer bearing red raspberries after harvest. Thin new canes to 3-4 canes per foot of row or 9-10 canes per hill. For black rapsberries, thin new canes to 10 per hill. Cut tips of new canes back around July 1. Cut raspberry tips back to 2′, blackberry tips back to 4″ and purple and yellow raspberry tips to 30-36″ above the soil. Keep orchard grass mowed and raked to discourage fungal pathogens harbored in tall grass and plant debris. Hang baited red sticky ball traps in apple trees for apple maggot control.